In part 1 of my new column, Superhero Mania (posted July 11th) I discussed my feelings of outrage towards the terrible abomination of cinema that was Ang Lee’s 2003 film, Hulk. There’s a checklist of things we want to see from a Hulk movie, and that film satisfied none of them. Not a one. If you want to read my thoughts in greater detail, read Superhero Mania, but suffice to say, I hated it, critics hated it, and moviegoers hated it. The studio admitted it as a failure, and Marvel was so disappointed that they acquired nearly 600 million dollars in funding to start their own movie studio and make superhero movies themselves. The film opens with a very cool opening credits sequence, which outlines how Bruce Banner became the Hulk. The Hulk’s origin story is one of the most simplistic ever written; genius scientist in experiment gone wrong. That’s it. The Hulk is not a superhero whose character lies in the origin; his character lies in how he lives as the Hulk, something the 2003 film failed to realize. For the reboot, they get the origin out of the way quickly and start the action in Brazil, where Bruce Banner is working in a soda-bottling factory, while simultaneously corresponding via internet with someone he knows only as “Mr. Blue” in order to find a cure. Bruce keeps a wristband on that checks his heart-rate, so if he gets too excited he can calm himself down without becoming the Hulk. On-screen titles inform us of the number of days without an “incident,” with the movie opening 157 days after his last hulk-out, and five years after the gamma radiation accident. Alright, so here’s the first thing on my checklist that the reboot satisfies; Bruce Banner living a terrible life while trying to make the best of it and find a cure. That’s one of the most classic elements of the Hulk; Bruce trying to cure himself. It’s here in full glory. Of course, every once in a while something goes wrong and the military is hot on Bruce’s trail. General “Thunderbolt” Ross has a mad determination to find Banner, because he wants to manipulate the powers of the Hulk into creating an army of “super-soldiers.” Much of the film follows Bruce’s attempts to evade the government while still trying to find the cure. Sound familiar? That’s the general plot of the TV series. Number two on my checklist would be to see Bruce on the run from the military; the 2003 movie really only scratched the surface of this, but the reboot fully embraces the TV show. Of course, if this were simply an adaptation of the TV show, it wouldn’t be as fun, especially to comic book fans. But the film really is a marvelous (perhaps even incredible) blend of the TV series and the comic books. 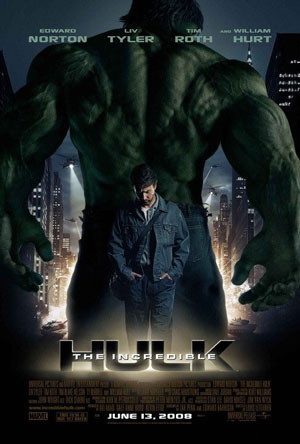 Soldier Emil Blonsky becomes obsessed with the Hulk, and over the course of the movie becomes the super-villain “Abomination,” whose powers are similar to those of the Hulk’s. Not only do you get the classic TV-style villains of the military, you get a comic-book super villain to go along with it. There are plenty of other great references to the Marvel mythology spread throughout the film. Iron Man hinted that there was a larger universe of Marvel heroes, but Incredible Hulk lays the groundwork for plenty of other Marvel films. There’s a healthy dose of references about Captain America (though they never mention him by name), an appearance by Tony Stark, and plenty of other small references, some of which I’m sure I didn’t catch. None of these detract from the film if you don’t understand; they’re subtle and worked into the narrative. Speaking of the narrative, one of the film’s greatest strengths is the fact that it has put together a fast-paced, fun to follow plot that twists and turns and comes to a spectacular climax at the end. The Hulk-Outs are spread far enough apart to allow for ample character development, and the Hulk scenes are long enough to let us bask in the awesomeness of the Hulk. There’s another thing to cross off the checklist. For “The Incredible Hulk,” Marvel has assembled another top notch cast, led by Edward Norton as Bruce Banner. Norton is as good at playing Banner as Robert Downey Jr. was at playing Tony Stark; of course, Banner isn’t as interesting a character, but Norton, a phenomenal actor, pulls the most out of the part. If Downey created Stark with dialogue, then Norton illustrates Banner with a lack of speech. It’s at least a half hour into the film when Banner has a large amount of English dialogue; he creates the character with body language, which is no small feat. I knew Norton was the right choice when I heard the casting news, and the film definitely proves that. Liv Tyler plays Betty Ross, and while she’s perfectly fine in the role, I wish they would have gone with a better actress. Tyler will never be mistaken for a great thespian, and she’s not a good enough match with Norton, but it’s a small complaint. William Hurt, on the other hand, is a fabulous General Ross; he’s malicious while never acting outright evil. Tim Roth is perfect as Emil Blonsky, and Tim Blake Nelson is excellent as ever in his small but important role as Samuel Sterns. The CGI Hulk is pretty darn great; you can still tell its digital, but after a minute or so you get into it and he blends perfectly in with the live action actors. The CGI model has plenty of texture and expression, something lacking from the 2003 incarnation, which was little more than a neon-green blob. The action is spectacular, and will have you on the edge of your seat. Director Louis Leterrier has a great visual style that always keeps the eye on the action; I can see a successful action-directing career in this man’s future. My only major complaint with the film is that it’s too short; Edward Norton and the director wanted a longer cut, at about 135 minutes, but the studio wanted it under two hours, and the studio always wins. The character scenes are simply great; the best parts of the movie are not the action, but the scenes with Bruce as a human recovering from his affliction. It’s obvious that some of these scenes were trimmed down, and I can’t wait for the director’s cut DVD. In the end, The Incredible Hulk contains everything I wanted from a Hulk movie, save for one thing; I really, really wish the film would have ended with Bruce hitch-hiking on a highway set to “the lonely man” theme from the TV series while the credits roll. That would have been perfect. The ending is still awesome, but I would have liked to see something like this. Marvel Studios should be very proud; they’re two for two with Iron Man and The Incredible Hulk, two movies that I’m sure will deliver a string of equally excellent sequels. If you’re a fan of the TV series, the comics, or just superheroes in general, you should love The Incredible Hulk.